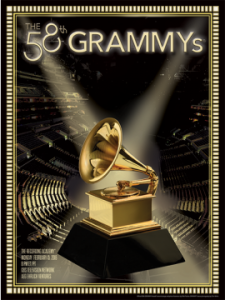 The 59th Grammys are coming (February 17, 2017) and the nominations were announced December 6 for Best Album, Best Record and Best Song … and everything else – that’s for another blog post. I was determined this year to find out the difference between album, record and song. It turns out its not really too difficult. For the purposes of the Grammys, an album is the simultaneous release of five or more tracks generally by the same artist. An interesting side note not directly related to the Grammys, the music industry now has a measure of album equivalents in order to measure popularity for purposes of lists such as Billboard’s top 200 in the age of digital and streaming music. Ten song sales or 1,500 song streams from an album are treated as equivalent to one purchase of the album. So, for 2016, Adele’s 25 was the top selling vinyl album in Canada while Drake’s Views was the over-all top album based on the sum of CD, cassette, vinyl, MP3 and streaming. So to my original question – what’s the difference between Record and Song of the Year for the Grammys. The Record Of The Year category recognizes the artist’s performance as well as the overall contributions of the producer(s), recording engineer(s) and/or mixer(s) if other than the artist. The Song Of The Year category recognizes the songwriter(s). (from www.Garmmy.org). That was too easy, but unfortunately lead me down the rabbit hole of how often does the same track win both record of the year and song of the year. Also, how often are these on the Album of the Year. Turns out, very often. Over the 58 years of the Grammys, the same track has received both Record and Song of the year occurred 20 times starting with Nel blu dipinto di blu (Volare) performed by Domenico Modugno at the first Grammy awards in 1959. On eight occasions the Album of the Year included the Song and the Record of the Year. The first time this occurred was in 1971 with Simon and Garfunkel’s Bridge Over Troubled Waters, followed in 1972 by Carol King’s Tapestry. Awarding Album of the Year to the album containing the Record of the year has occurred seven times while the Album of the Year containing the Song of the Year has only occurred once – U2’s Album How To Dismantle An Atomic Bomb which included Song of the Year Sometimes you can’t make it on your own.